One Idahoan will get a shot at a grizzly bear this year. Here’s how it will work. Mon., July 2, 2018, 1 p.m.
One of the most unusual — and perhaps controversial — hunts in Idaho history is scheduled to occur this fall. Idaho Fish and Game will hold a lottery for one grizzly bear tag for the 2018 season. The deadline to apply is July 15, and the August draw is limited to Idaho residents. It’s still possible the hunt will be canceled depending on the outcome of a federal court hearing in August in Montana. Idaho’s hunt begins Sept. 1. Here’s why and where the hunt is happening, what the hunter can expect and why Idaho is limited to one tag. Why is a grizzly hunt happening now? The U.S. 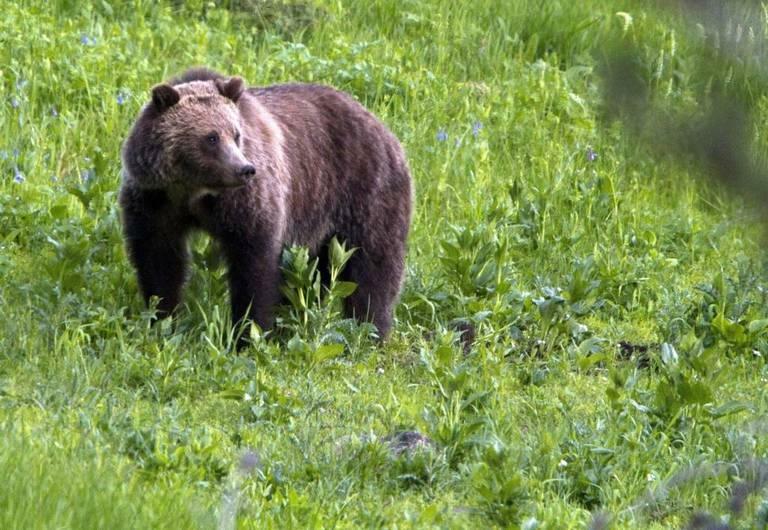 Fish and Wildlife Service removed the Greater Yellowstone Ecosystem grizzly bears from the endangered list in 2017, giving Idaho, Wyoming and Montana more management responsibility. Hunting will be allowed when the population exceeds 600 bears. The 2017 population estimate was 718 in the Yellowstone demographic monitoring area, according to Idaho Fish and Game — up from fewer than 200 in the 1970s. The population has ranged from 694 to 757 over the past decade in a DMA that includes Yellowstone and Grand Teton national parks, where hunting won’t be allowed. Idaho Fish and Game received more than 900 comments while considering its grizzly season. The majority favored the hunt, according to the department. Fish and Game commissioners approved the hunt in May. Idaho’s season will run from Sept. 1 to Nov. 15. The limit is one bear. No female accompanied by a cub, or young bear accompanied by an adult, may be taken. The hunt will take place in portions of hunting units 61, 62 and 62A, in the Island Park area of East Idaho. How did Idaho decide on one grizzly tag? Grizzly tags for the Greater Yellowstone Ecosystem are set based on acceptable mortality for the grizzly population. Of the bears available for hunting, Wyoming gets 58 percent, Montana gets 34 percent and Idaho gets 8 percent, based on the proportion of the land in the demographic monitoring area. The percentages don’t include Yellowstone and Grand Teton land. Idaho was allocated 1.3 bears, Boudreau said, which was rounded down to one. Who can apply? How much does it cost? Only Idaho residents with valid hunting licenses can apply. There’s a non-refundable application fee of $16.75 and each applicant must prepay for the tag, which is $199.75 or $166.75 depending on the hunter’s Price Lock status. Tag fees are refunded to unsuccessful applicants. If the hunt is canceled, the application and license fees won’t be refunded. Grizzly harvest is a once-in-a-lifetime opportunity. A successful hunter can’t apply again. How much interest has Fish and Game received? As of late last week, 379 hunters had applied for the grizzly hunt. That’s low compared to the nearly 170,000 applicants who participated in the draw for controlled hunts involving deer, elk and antelope last year. The low odds of getting a grizzly tag likely have played a role, Boudreau said. What will the hunt be like? The hunter has a choice of weapons but most likely would choose a rifle, Boudreau said. Baiting, electric calls and use of dogs won’t be allowed. What kind of assistance will the hunter receive? Because of the special nature of the hunt, Fish and Game will spend some time educating the hunter — with an emphasis on distinguishing between male and female grizzlies. The preference is for the hunter to take a male bear. Does Idaho have grizzly bears elsewhere? Yes. Smaller populations of grizzlies, still listed as endangered, live in the Selkirk and Cabinet mountains of North Idaho. Published: July 2, 2018, 1 p.m.